Inventor Nesting is CAD-embedded sheet metal nesting software that helps optimize yield from flat raw material. 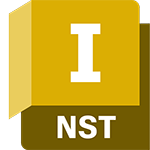 Inventor Nesting works right inside Autodesk® Inventor® software, so nesting studies can be created and then updated to reflect any changes to the design. Easily compare nesting studies to optimize efficiency and reduce costs and export 3D models or DXF™ files of the completed nest for cutting path generation. Ensure you have Autodesk Inventor Professional installed prior to downloading Inventor Nesting. NOTE: This product was formerly known as Nesting Utility. To access the 2018, 2019 versions you can download Nesting Utility here.